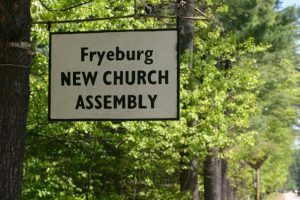 Fryeburg New Church Assembly is a retreat center of the Swedenborgian Church of North America in Fryeburg, Maine. Every year, Swedenborgians from around the country, and all branches of the movement, gather for two weeks of lectures, activities, spiritual practice and contemplation in this scenic New England setting. Devin Zuber, this year’s Everett K. Bray visiting lecturer from the Graduate Theological Union and Center for Swedenborgian Studies in Berkeley, CA, discusses the work of Sarah Orne Jewett, George Inness, and the art of Swedenborgian) ornithological conservation.